Officials with the Washington State Patrol believe that a serious motor vehicle accident in Auburn on Thursday morning was caused by drivers who may have been street racing in the moments leading up to the accident. Police say that a three-car collision occurred at approximately 11 a.m. Thursday in the eastbound lanes of State Route 18 near Green River in Auburn. Two vehicles – a Porsche and a Chevrolet Camaro – that were involved in the accident are believed to have been participating in street racing just before the crash occurred. 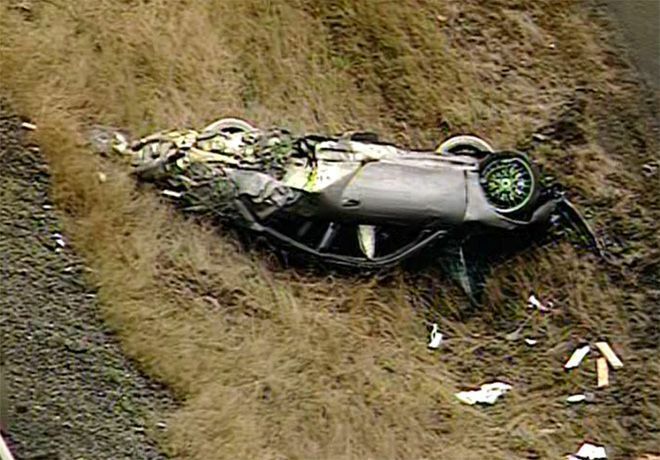 As you can see in the image above, the Porsche left the roadway at some point and eventually rolled over on its roof before coming to a rest. Troopers say that the Porsche also caught fire after leaving the roadway, but that a witness was able to put out the flames before any major damage occurred. The driver of the Porsche suffered a broken leg in addition to serious internal injuries, though officials did not disclose the nature of those injuries. Troopers are currently investigating the street racing accident as a vehicular assault, and at least one person has been taken into custody as a result of the investigation. If you or a loved one has been injured in an accident caused by another person's negligence, you may benefit from hiring an experienced personal injury attorney to represent you in a case against the at-fault party. Davis Law Group has helped accident victims get the compensation they deserve for more than 25 years. We offer a free case review to anyone who has been injured in an accident in Washington state. Call our office in Seattle at (206) 727-4000 or use the confidential contact form on this page to request a free legal consultation with our award-winning legal team.